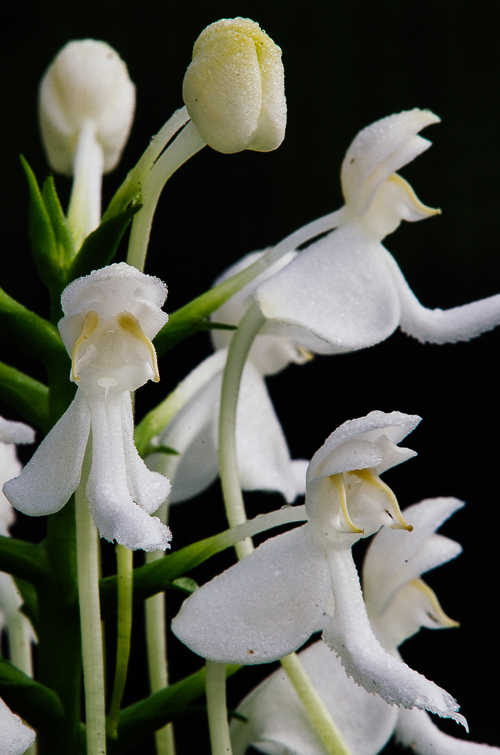 Monkeyface Orchid (Platanthera integrilabia) is one of our prettiest native orchids, though if you've seen it you can consider yourself lucky. Although it ranges from the southeastern to the south central United States, Monkeyface Orchid is rare throughout its range, occupying a very limited wetland niche: seepage bogs or slopes, and streamheads in open forests. There are only eight known populations in the Georgia Piedmont, all of them decreasing in size and vigor. 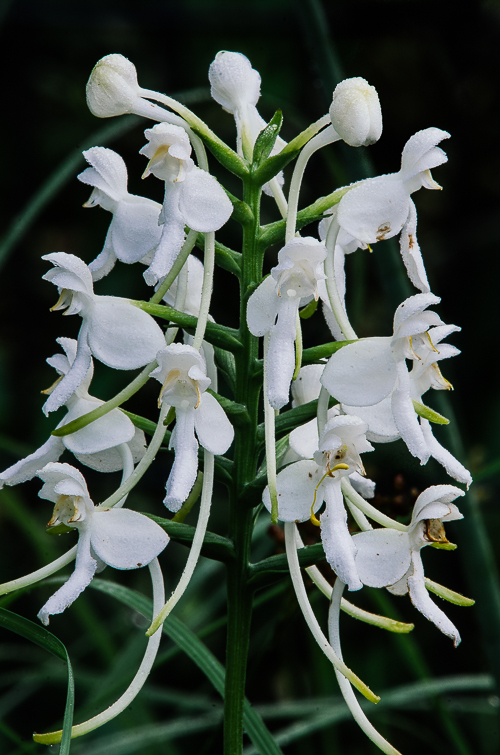 Urban encroachment, large scale conversion of habitat into timber production and competition from invasive exotic or overstory plants have made Platanthera integrilabia a threatened species in Georgia and a candidate for protection under the Endangered Species Act. The good news is that some constructive action is underway to protect Monkeyface Orchid in Georgia. Four sites in Georgia are the focus of a new conservation project funded by the National Fish and Wildlife Foundation's Five Star/Urban Waters Grant Program. It will be conducted by ABG in partnership with a number of other organizations. * The goal of the project is to restore the habitat and reintroduce plants grown from seed (collected on site and germinated in ABG's lab) into their restored habitat. Restoration will take time and lots of hard work. Matt Richards, ABG's Conservation Coordinator, is spearheading the project for ABG. According to Matt, these sites are under constant pressure from illegal trash dumping, competition from invasive exotic plants, closure of the forest canopy and herbivory. The first step will be to map and survey each site. Next, a management plan will be developed for each site, taking into account the threats specific to each site, with the immediate goal of protecting the existing plants. Some sites may need deer fencing. At others, saplings will be removed and mature trees girdled to remove competition and open the canopy. Invasive exotic plants will be removed; garbage will be hauled away. Monkeyface Orchid flowers in August. Capsules mature in about three months. Matt will collect capsules and germinate the seed in ABG's lab. 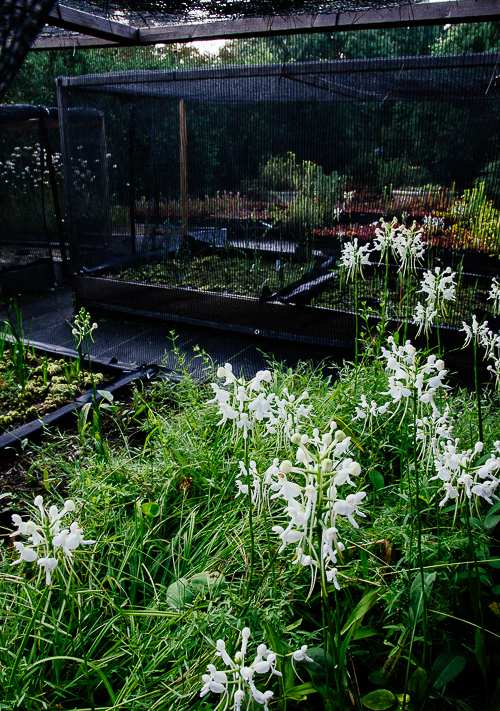 The germination rate in cultivation, according to Matt, is low compared with that of tropical orchids, only about 50%. In the fall, Matt will plant deflasked seedlings in beds in our nursery, where they will remain for about a year. Once the habitat has been restored and a management plan enacted, Matt and his associates will reintroduce seed propagated plants. At this stage the goal will be to establish flowering sized plants that produce seed. Fall is the season that Matt prefers for outplanting of year-old seedlings. It takes another two years for the plants to flower. Habitat management will continue in the meantime, and the sites will be monitored. In the United States many threatened ecosystems occur in and around urban areas, and they are a high priority for restoration despite their often degraded condition and remnant status. "It's significant that we have wetlands and natural areas in Metro Atlanta that harbor rare plants like Monkeyface Orchid," said Dr. Jenny Cruse-Sanders, Vice President for Science and Conservation at ABG. It is important that we focus our efforts and expertise towards conserving this species in our own community." Congratulations to our conservation team on this exciting new project!